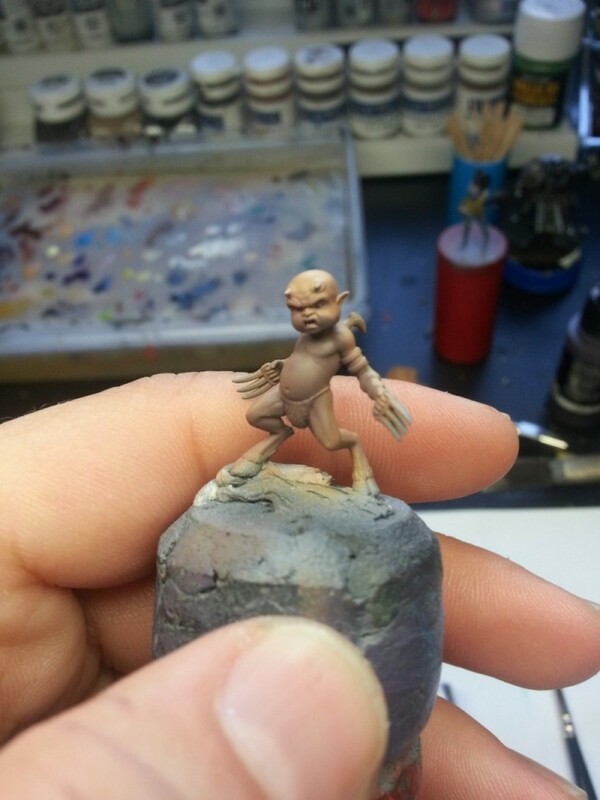 So I´m painting the Malifaux Terror tot and got a question on twitter about how I did the skintone. 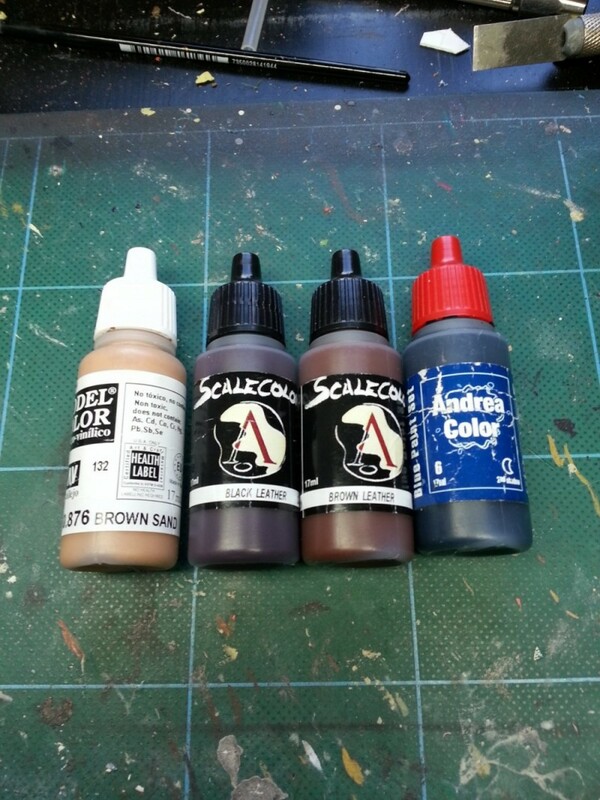 And so this Malifaux painting tutorial was born. I´m sorry that i don´t have pictures of every entire step but I was painting and didn´t thought that anyone would be interested in seeing this. I started to prime the miniature black using matte black from Vallejo model color with my airbrush, then I sprayed him from above and where the light would hit him using White from Vallejo air color. I realized that since I mix colors it´s hard to understand exactly how the end result should look, but if anybody is intrested I did paint the colors on a piece of paper (my pallet was to messy, no one could look at it without having a brain meltdown…). As you can see the white paper has a hint of pink/purple in it, that´s a reflection but still, it shows colors somewhat accurate. The first layer of flesh was made using a mix of Brown sand (VMC) and Black leather (Scalecolor), I would guess it was about 3 parts Brown sand and 1 part Black leather. Next I mixed in a drop of dark blue (I used the final shadow from the blue paint set from Andrea). 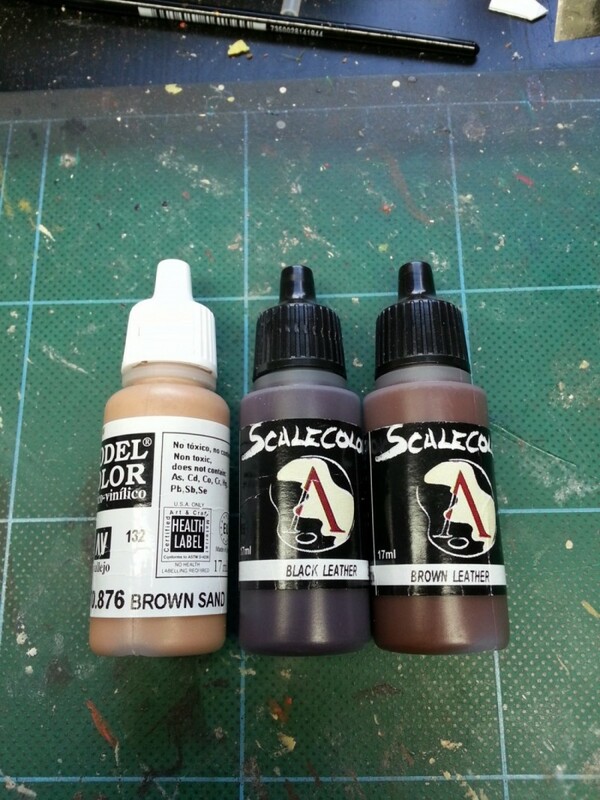 With this mix I started to pre-shadow the miniature, spraying from the feets and up, the same way as I would do zenithal priming but I turned the miniature upside down. 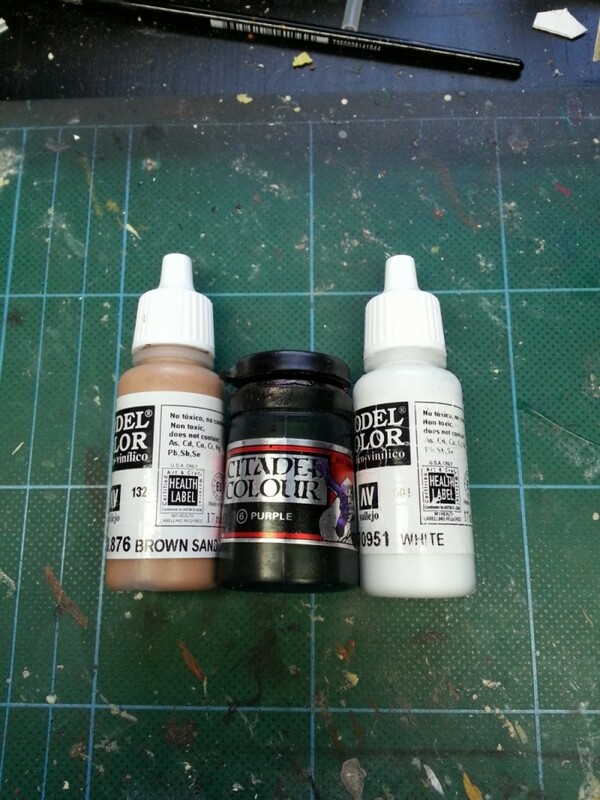 When this step was done it was time to put away the airbrush and bring out the regular brushes (my favourite part!). Now the mini looks like this. 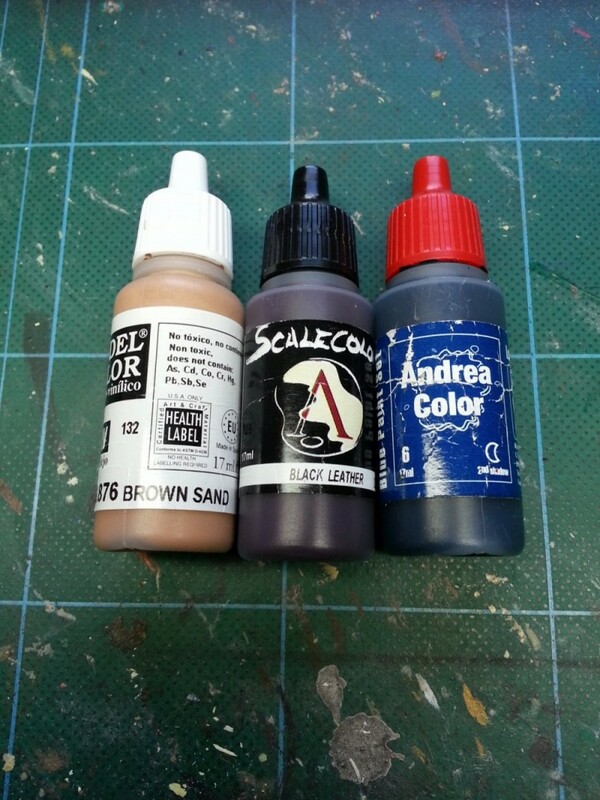 I started to mark the deepest shadows using a mix of Dark sand, Black leather, and Brown leather (Scalecolor). This was used as a glaze just putting the colors where the shadows would be. 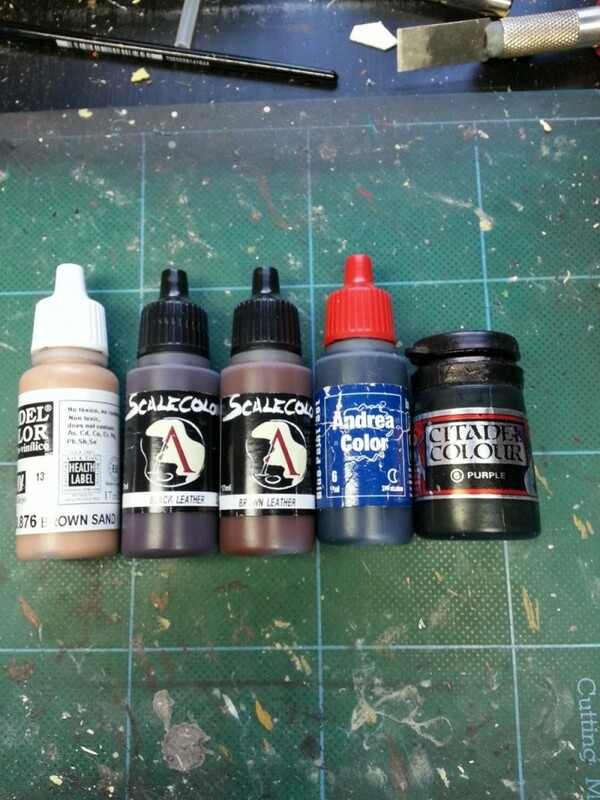 The next step was to take add a drop of the dark blue to the last mix, making the darkest shadows even darker. 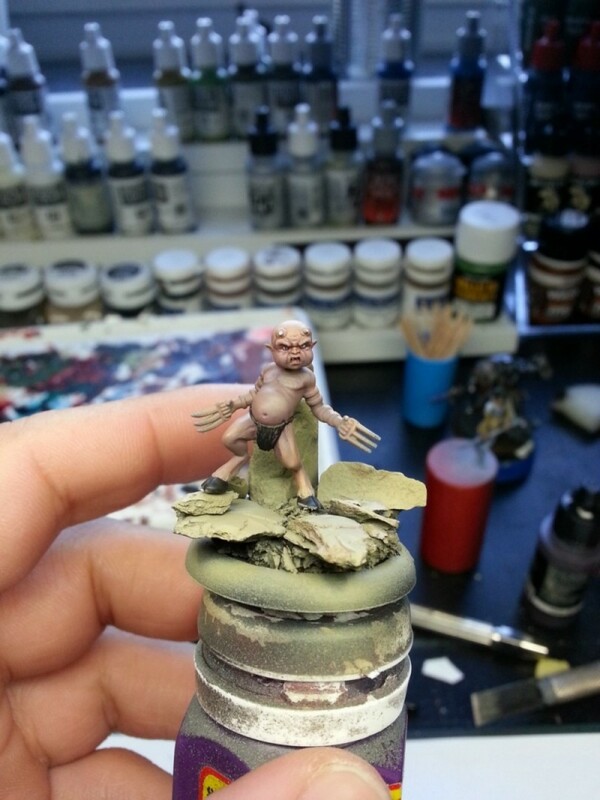 I then added a tiny bit of Purple ink to the mix and did a glaze wich I carefully glazed over the skinparts. The glaze should be so thin that it just gives you a hint of a change in color on the skin but adds more deep to the shadows. 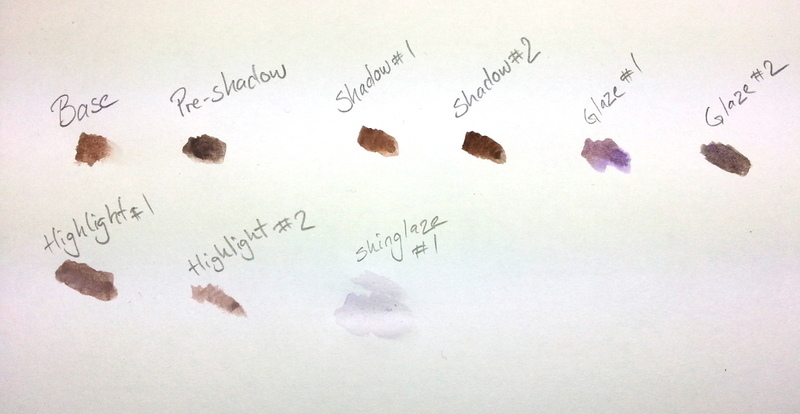 Now it´s time to start building up the highlight´s, I use Dark sand, a tiny bit of purple ink and a tiny bit of white. This mix should be very thin, but not as thin as a glaze. I used this mix to mark out the strongest highlight´s. I keept adding white to the mix until I got a result that I was happy with. At this stage I also painted the eye´s. Starting with blocking out the whole eye using black leather and then painted the eyeball off- white. the pupil was painted using a mix of Black read from Vallejo model color and a tiny drop of black. To add more purple to the skin I did an ultra thin glaze of purple ink and white and carefully glazed it onto the skin. This is pretty much as far as I have gotten at this point, I will add some more glazes to the skin trying to smoothen out the skin and make some interesting color shifting. I´ll summarize the rest of the skin up in my next post! Seconds after this pic was taken I tried to adjust the mini on the base (Don´t ever do that using force!) and of course, I broke his arm. I´ll se if I can fix it or if I´ll try tu use the “scars” as just scars or something. Time will tell! Untill then, keep your colors wet and your brushes pointy!